The fourth round of the Top League kicks off this weekend with one match-up on Friday and the remaining seven games on Saturday. Verblitz has surprisingly managed to leapfrog last week’s co-leaders to top the Red Conference. The Toyota Motors’ team has 11 points; three clear of Suntory and Hino after they both lost in round three. In the White Conference, Panasonic and Yamaha secured victories against their respective third round opponents. Jubilo however claimed a bonus point with its win over the Heat and currently finds itself the sole leader of that division. Heading into the half-way point of the Top League pool games the Black Rams have won two and lost one. They currently sit third on the table below Panasonic and Yamaha. Last week, Ricoh outscored the Coca-Cola Red Sparks five tries to two in a 36-15 mauling. This week the Black Rams face the Eagles who were beaten into submission 14-3 by Kubota Spears. With home advantage and also having won the last two battles between the two sides, the Black Rams should beat the Eagles by seven points or more. It hasn’t been a great start to the season for the Toshiba Brave Lupus team. Last week they fell to their second loss, going down 31-24 to Panasonic. A bonus point victory on Saturday however could see the Fuchu-based squad thrown back into the mix and end up within striking distance of the top three performing teams. The Red Sparks on the other hand are in dire straits after recording their third loss in as many games, and their second playing at home. 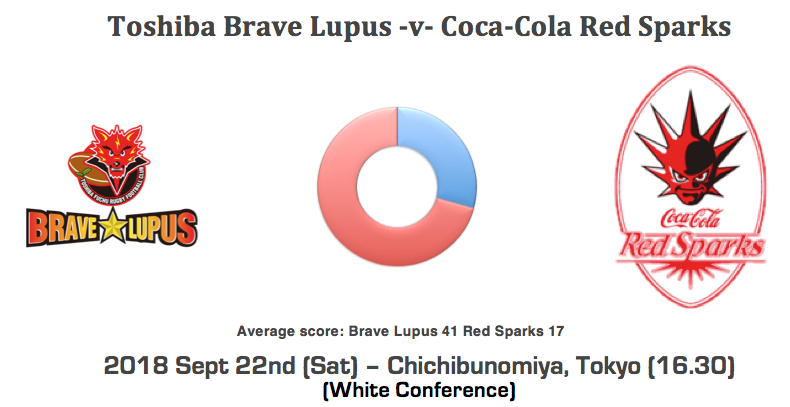 Although last week’s effort from the Coca-Cola team was an improvement on their first and second round heavy losses, facing Brave Lupus away is a tough ask for a team that has leaked 21 tries in three matches. Toshiba will enjoy this match after giving it their all in the loss against Panasonic. Brave Lupus should be able to easily extinguish the Red Sparks and win by 25 points or more. This crucial head to head between table-topping Yamaha and second-placed Panasonic will be the match of the round. Each unbeaten team will be vying to exert its dominance going into the second half of the group games. In round three Panasonic crafted a good win over Toshiba on the back of some individual brilliance by the Wild Knights’ no. 10, Takuya Yamasawa. The talented 23-year-old fly-half contributed 21 points through two tries, four out of four conversions and a penalty to boot. Yamaha has its own star with full-back and goal-kicker Ayumu Goromaru who is expected to start on Saturday after being rested in last week’s 36-16 dismantling of Honda. Panasonic is just getting into its stride and has so far found the will to close out tough matches. At home, the Wild Knights should be able to valiantly defend their castle and put visiting Yamaha to the sword by seven points or less. Red Dolphins are new to the Top League this season and this Saturday will see the first ever meet between these two teams. In the previous round, the Shining Arcs blew the Shuttles away 64-26 to achieve both their first win and the highest score of the competition. After claiming a decisive victory in round one against the Sanix Blues, Hino has failed to repeat that eye-opener, notching up two losses. Last week, Toyota Verblitz conquered the Top League newcomers 36-14. The Shining Arcs finally awoke from their slumber to shunt aside the Shuttles last week. In round four NTT Com. will play a team that is currently in a slump. The Shining Arcs should continue their free-flowing rugby style and cruise to victory by 10 points or more. Last weekend two-time defending champion Suntory suffered its first loss of the season losing 36-20 to a Steelers side expertly marshalled by three-time World Rugby Player of the Year Dan Carter at the helm. As a result Sungoliath was knocked off their perch at the top of the Red Conference by an invigorated Verblitz outfit. NEC by contrast, recorded their first win of the competition, comfortably beating the Blues 24-15 away in Fukuoka. The Green Rockets face a wounded Sungoliath that will want to atone for last week’s blemish and get back to their winning ways. Suntory should beat NEC by 10 points or more. This match-up promises to be another juicy meet-up. Conference leaders Toyota Verblitz will battle a team that swept away the defending champions Suntory. The main destroyer for the Kobelco Steelers was former All Black Dan Carter who racked up 21 points on his debut. Verblitz on the other hand let Sungoliath steal the game in cruel fashion - with an 88 minute try - back in round one. All credit to Verblitz though as the team has answered critics with good wins over NEC a fortnight ago and a 36-14 thumping of the Hino Red Dragons last Saturday. The question is will Carter start again for the Kobelco Steelers? After a commanding performance last week which included a five-pointer, two conversions and four penalty kicks, the world-class fly-half could again make some serious inroads into his opponent’s defensive line. Looking at these two team’s playing history there’s almost nothing to separate the sides. But that was before the Steelers had Carter in their ranks. A confident Kobelco side should be able to carry on from where they left off against Suntory and add another prized scalp to their unbeaten run. The Steelers should win this by seven points or more. Last week Honda Heat was soundly beaten by Yamaha Jubilo 36 - 16. The first win of the season still eludes the Heat. Whereas Kubota Spears - after narrow losses to both Panasonic and Yamaha - ground out their first victory, winning 14-3 victory against a determined Canon Eagles side in round three. Kubota weathered the storm in the earlier rounds and finally tasted victory. The Heat came close to winning in round two, but last week was totally outplayed by a strong Jubilo side. The Spears should beat the Heat by seven points or more. The Sanix Blues are currently rooted to the bottom of the Red Conference with seventh placed Honda five points clear. The Fukuoka-based side suffered a first round loss to Hino. The earthquake in Hokkaido led to the cancelling of their game in the second round and the Blues were then beaten at home 24-15 by NEC. This weekend Munakata Sanix is up against the Shuttles who until last week were going along nicely, with two wins from two. Last Saturday however the Toyota Industries team was subjected to a good old-fashioned thrashing by the NTT Com. Shining Arcs. It was a horror show as the Shining Arcs piled on 64 points of misery to the home team’s 26. The Shuttles will have taken a huge dent in confidence after that hammering. Can they recover in time as they face a Blues side that has nothing to lose? The Blues are due for their first victory and will play a Shuttles team that has to be low on confidence. This is the perfect opportunity to strike. Sanix should win this by seven points or less.